This week sees one of the year’s most anticipated movies hit theatres, likely crushing the box office and providing another monster hit for Disney. You know, in case anyone thought that Solo not breaking records was actually going to hurt that studio. Anyway, The Incredibles 2 was probably my second most anticipated movie of the year after Black Panther, and I’m looking forward to seeing it especially after all the positive reviews. So this week’s pick was obvious, even if I do feel a little gross about going back to the animated Disney well so soon. But this movie deserves it. Pixar Studios was on a hot streak in the early 21st century. After staking their claim with the first two Toy Story movies they proved to have more in the tank with beloved megahits Monsters, Inc. and Finding Nemo. For their sixth film, they spread their wings in a big way by taking a pitch about a family of superheroes from writer/director Brad Bird. Bird brought experience from the critically beloved but commercially limp The Iron Giant, and also brought a new slew of challenges. While Pixar had proved they could make plastic toys, insects, monsters and fish work as animated characters, this would be their biggest challenge; making a movie where all the main characters were human and make it look good. But The Incredibles doesn’t just look good. It is good. Fourteen years later, when a lot of the compositing of the scenery and the lighting actually looks poor in comparison to other movies, this movie still holds up because of a truly magnificent script. Much like Toy Story before it, Pixar was pushing the envelope with technology while also making sure the movie would be an enduring classic. And that’s why it still has an audience dying to see its sequel more than a decade later. When I sat down to watch this movie for review purposes, I actually got a little overwhelmed by how good The Incredibles actually is. Specifically, I was simply astounded by the variety of ways in which the movie succeeds. The movie perfectly balances at least six character arcs, including all four members of the Parr family as well as two villainous characters. And it accomplishes this while juggling between several genres and building a complex world. It is entertaining for children and downright compelling for adults, providing thrilling and cleverly composed action scenes, and knocking the humorous and heartfelt moments out of the park. Despite being a superhero movie, it draws just as much inspiration from James Bond movies. While a lot of the runtime is a high-octane adventure, just as much is a low-key domestic comedy, almost a TV sitcom at points. We’ve all heard someone make a joke about how it’s the best Fantastic Four movie ever made, but that is selling this movie short. Animated movies have a stigma for being “just for kids”, but large parts of this movie are concerned Bob’s midlife crisis and existential dread, Helen’s overworked home life and fear that Bob is having an affair, the couple’s marital troubles (and barely veiled sexual life), the how this is negatively affecting the children. And it’s not afraid of going dark. A major plot point revolves around an attempted suicide. The main protagonist threatens to murder a defenseless woman in a grief-stricken rage. A mom tells her children that the villains won’t hesitate to kill them, and the film’s final moments are an attempted kidnapping of an infant, perhaps the worst fear of any parent. That’s a lot of “grown up” stuff in a movie that’s ostensibly just meant to babysit your kids. The Incredibles is certainly a movie for all ages, respecting the adults in the audience but not leaving the young or the young at heart behind either. The film is quite funny whether it’s riffing on genre tropes, presenting amusing side characters like Edna Mode or Frozone’s wife, or using the supers’ powers for creative physical gags. I really love how this movie takes every chance it has to show the powers and how it affects every aspect of the Parrs’ lives, from household chores to workout regimens. And of course, it more than delivers in the actions scenes. 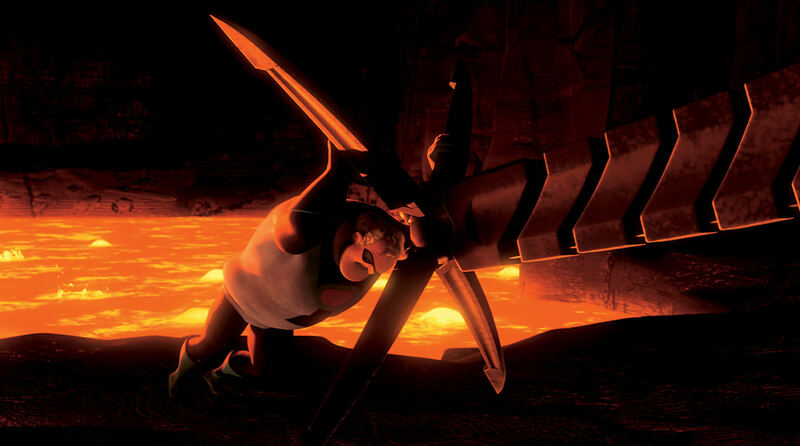 Mr. Incredible’s first fight with the killer robot is phenomenal, Elastigirl infiltrating the base and getting stuck between two doors is ingenious, and the first time we see Dash and Violet using their powers to defend themselves is absolutely riveting. I especially love how each Parr’s super abilities reflects their personalities and their needs. It’s great character work. That character work has always been the heart and soul of Pixar’s movies. Toy Story made waves because of its innovative animation, but it endures because people love Woody, Buzz and the rest. 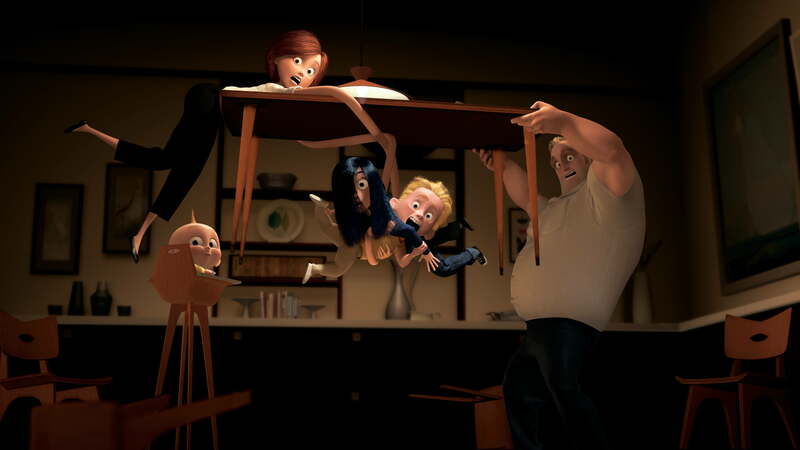 The Incredibles was Pixar’s most ambitious movie yet in terms of character and set design, and proved that even a computer-animated film could provide blockbuster spectacle and down-to-earth human drama. Long before the Parrs don their matching red suits and become The Incredibles, you invest in their problems and want them to overcome them. That those issues are resolved by coming together and bonding as a family gives the movie plenty of emotional punch – that that also means forming a superhero team to more effectively take down giant robots and gloating super villains is just icing. The Incredibles is something of a victim of its time. In 2004, it was a highly innovative game-changer in a genre that was barely a decade old. But what was cutting-edge tech in 2004 is extremely dated in 2018. Backgrounds look barebones and fake, human characters feel pasted onto a scene instead of having real weight, and things like hair and especially lip movement just looks pretty bad. This isn’t the movie’s fault, as I said it was mind-blowingly impressive when it came out, but it sticks out to me more in this movie than in most of its contemporary Pixar brethren. Progress in this genre comes at a lightning pace, and even by 2007 Pixar had surpassed the look of humans with Ratatouille. Sometimes it’s good to sit back and appreciate just how young the art of CGI-movies are. One of the more substantial criticisms of the film is that, intentionally or not, it does promote a view of the world that Ayn Rand would be proud of. Truthfully, it is hard to deny that talks about how superheroes are special sometimes feel like this. Whether it’s Dash telling his Mom that if everyone is special then nobody is, or Syndrome reiterating this point in one of his villainous monologues, it’s definitely there if you want to look for it. Now, I’m no fan of Objectivism. In fact I find it to be a repulsive and generally ineffective way of viewing the world. But I tend to side with Brad Bird here and say that what is in there is not intentional or malicious, but rather a natural aspect of the story. And certainly not an incidental one, if Bird’s Tomorrowland is anything to go by. But it could perhaps serve as an interesting aspect for the sequel to tackle? Honestly, after watching the movie on Tuesday for this column, I realized I wasn’t adequately prepared to do The Incredibles justice. One could take a deep dive into pretty much any of the main cast and find something compelling. It’s a movie that’s truly for everyone. Not really into the whole superhero thing? Bob’s troubles at work, Helen struggling as a stay-at-home mom and their troubled marriage is relatable and compelling. Too young to appreciate those domestic issues? 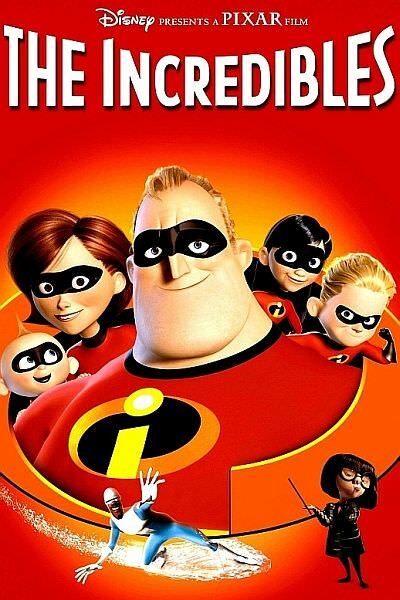 The Incredibles delivers exciting, creative action scenes and a ton of laughs. Need some inspiration for your next big superhero screenplay? This movie gives four heroes and a villain meaningful arcs that compliment each other, culminate at the same time, and never feel like they are hurting the others. 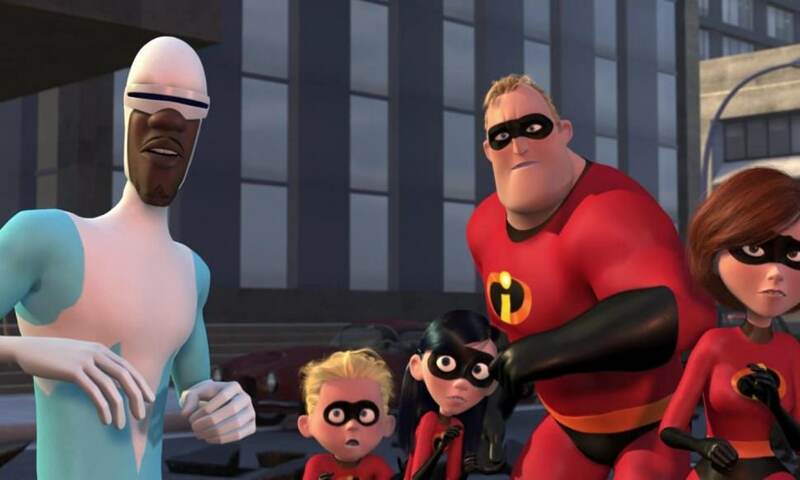 The Incredibles may not have aged perfectly in terms of its animation and it has some questionable politics in the margins if you want to look for it. But the movie more than lives up to its name. It is so good in so many different ways that it kind of knocked me for a loop on my last viewing. This movie is a certified classic both in the canon of Pixar films and in the superhero genre. My only worry is that there’s no way the sequel can live up to the original. I log reviews for every film I see, when I see them. You can see my main page here. I recently binge-watched all four Jurassic Park movies in anticipation of Jurassic World: Fallen Kingdom. Which doesn’t look great, but I love dinosaurs and since Hollywood has decided only Jurassic Park gets to do dinosaurs I guess that’s what we get. Just please be better than Jurassic Park III?